This is a guest blog entry by Lennart; I am currently visiting the Havelle-crew with my wife Andrea. While it is a great honour to appear in this blog, I must apologise that I am writing in English… but my Norwegian skills are limited to basic Danish (! ), so I guess it will be easier for everyone if I stick to English. After a long (2000 km in five days) journey from northern Germany, we met Helleik and Elise on Thursday in Lofoten, following their invitation to join them for a couple of days on their sailing trip. Since that day, our car has been parked on the shore just opposite the beautiful island of Ulvøya, where we can sleep, cook, eat, play board games, light fires and watch “the llama” in a house in Lauksund owned by Elise’s family. The island is permanently inhabited only by a farmer on the other side, a flock of sheep and a guard llama. This llama has become our central point of attraction in the last couple of days: watching the lama and just feeling happy (it works! 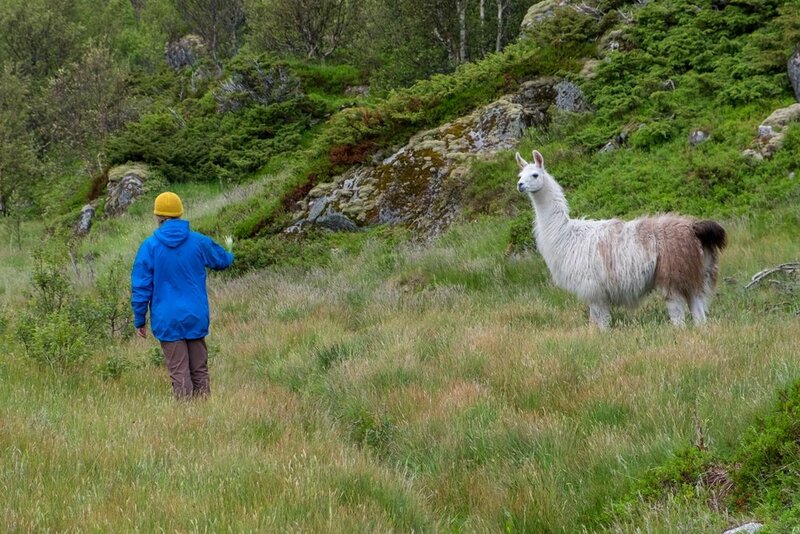 ), collecting wool (2% llama, 98% sheep), imitating its noises when it feels danger (whiiiiii) and searching for the llama whenever we approach or leave the island on our multiple trips. The first night on the island ended close to mayhem. We had arrived late in the evening around 10 pm and the weather was so great that I had been swimming in the afternoon. 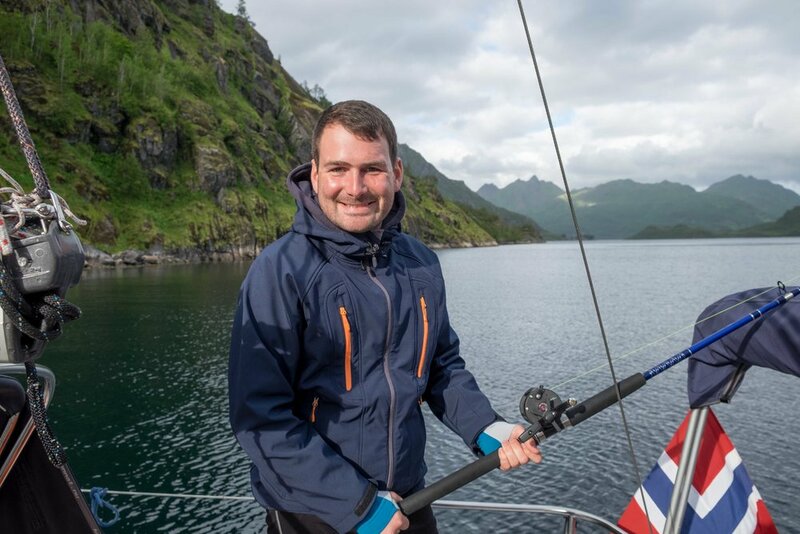 The wind was due to pick up in the night, so Helleik and Elise anchored the Havelle safely – so we thought – in the barely 50-metre-wide sund on the south side of Ulvøya and returned elegantly on their stand-up paddles to the house. We had a late dinner and went to bed after midnight. It was at 5 am that I woke up because of the window of our bedroom slamming due to the strong winds. Feeling restless, I went down to the kitchen window, looked to the boat and saw – no boat. I then ran over to the living room, looked out of the window and saw the Havelle drifting eastwards, pulling her own anchor and about to hit the cliffs of our island within the next minutes. 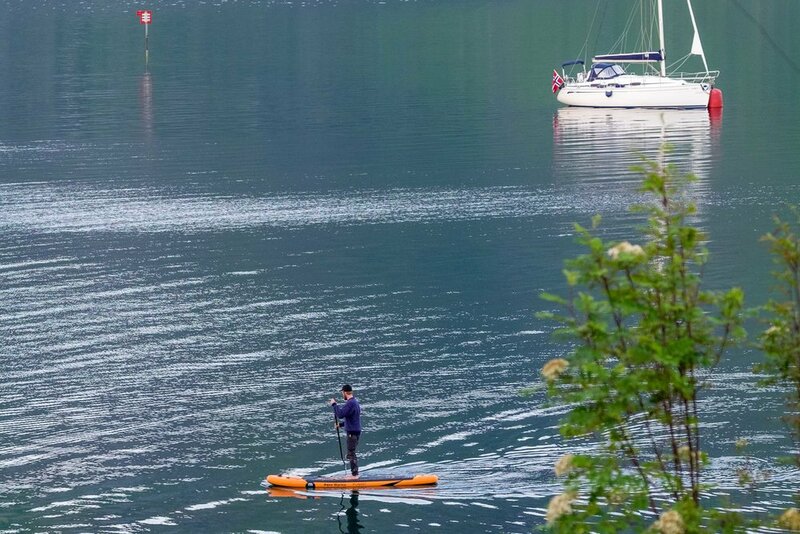 Before I had completed the thought of waking Helleik and Elise, I saw a brave Norwegian youngster with a long beard and a bright blue knitted pullover stand-up-paddling through the sund against the waves and towards the Havelle. Each slam of the windows in the house saw Helleik getting hit by the wind an instant later, fighting the waves but not falling, and reaching the Havelle just in time to climb aboard and start her motor. A minute later, Elise ran in a bright orange redningsvest from the boathouse around the house to the next bay which hosts a small wooden pier, climbed aboard and the Havelle rapidly left the sund bound for the “mainland” (which is of course just a larger island in the maze between Lofoten and Vesterålen). I went back to sleep and woke up at around noon to find a text message from Helleik saying that they spent the night safely on a pier on the mainland and were due to return soon as the buoy at the sund entrance was now free as a safe spot for the Havelle. Friday afternoon saw Helleik and myself maintaining a small rowing boat on the island which would get the four of us safely to and from the Havelle without the need to stand-up-paddle (I am not a Norwegian with a long beard and bright blue pullover, so I am very happy that I do not need to stand-up-paddle the various waters of Lofoten and Vesterålen). We spent the afternoon visiting Trollfjorden and it was fantastic to see the steep mountains dropping into the sea, the eagles flying above the fjord and the panoramic view to the snow-covered mountain-tops. We then roamed the area for fishing spots with little luck – a small coalfish and a medium-sized cod were the result of a four-hour trip. This was enough for us to make a tasty and warming – the overnight wind had let the temperatures drop to little over 10 degrees – fish soup, which we enjoyed on Friday evening. Saturday was marked by greater fiskelykke. We also met Hurtigruten on the way around the island in the Raftsund and were once again flashed by the luck to visit the islands with such great local guides. The catch of the day was a little coalfish and four medium-sized cods of which Andrea caught the largest. This catch was thematic for the food since Saturday: fried cod “Norwegian style” pure with sour cream, fish curry and today cod from the oven with rice and vegetables. Fresh fish from the sea is a rare thing in Germany, so this has been another great experience for us. After spending several evenings with board games, we motored to the village of Digermulen just south of Ulvøya on Monday afternoon, did some basic shopping at the nærbutik (“Bruk nærbutiken når du er ung, så har du den når du er gammel og tung”) and then hiked to the top of Keiservarden approximately 350 m above sea level. Although Helleik predicted better weather by the time we reached the top, the clouds did not clear before we were halfway back down, which then rewarded us with some middleearth-like views of Lofoten – rugged black peaks in the clouds, tiny villages on the shore and all of it framed by the deep blue sea. The wind on the way back was excellent for sailing, so we could experience the feeling that has become so normal for the Havelle-crew for just a few minutes: only the waves and an occasional gust of wind, nature around us and the Havelle cutting silently and steadily through the deep waters of Norway. It is these moments that make us feel like we are on a very unique holiday and that let us understand the fascination of Helleik and Elise’s “Norwegian summer”. As the fog lifted we had a wonderful view on the way back down. It is now Tuesday morning 1:30, the MS Nordnorge of Hurtigruten just passed our window northbound and the sky has cleared to reveal some mountaintops in the midnight sun. The next couple of days we expect a fantastic Lofoten summer with around 20 sunny hours per day and temperatures above 15 degrees, so we might spend a lot of time outdoors and maybe even in the fresh sea. On Thursday, Andrea and myself will finish our visit and travel eastwards with our car towards Sweden and Finland, while Helleik, Elise and the Havelle will slowly prepare for their long journey south. It has been a great stay in Lofoten, a unique opportunity for us, many adventures to remember and a very nice time with the two of you and Havelle – tusen takk for denne gang!